You searched for which does not fit your . We've redirected you to 280-3127, which has the proper fitment. • Celebrate J&P Cycles 40th Anniversary with a custom designed Dixxon Flannel! S 36-39" 36-39" 36-39" 17" 30.5" 33-35"
M 39-42" 39-42" 39-42" 18" 31.25" 34-36"
L 42-46" 42-46" 42-46" 19" 32.25" 34.5-36.5"
L- Tall 42-46" 42-46" 42-46" 19" 33.25" 37.5-39.5"
XL 46-49" 46-49" 46-49" 20" 33" 35.25-37.25"
XL - Tall 46-49" 46-49" 46-49" 20" 34" 38.25-40.25"
2XL 49-52" 49-52" 49-52" 21" 33.75" 36-38"
2XL - Tall 49-52" 49-52" 49-52" 21" 34.75" 39-41"
3XL 52-55" 52-55" 52-55" 22" 34.5" 36.25-38.25"
4XL 55-58" 55-58" 55-58" 24" 35.25" 37-39"
5XL 58-61" 58-61" 58-61" 25" 36" 37.75-39.75"
Dixxon Flannel Co X JP Cycles =100%. It's a flannel shirt--what is there to say right? Washed and dried this shirt and it was amazingly wrinkle free. It's got some special anti wrinkle magic in it. Well made Dixxon! Been looking for a Dixxon shirt for awhile. Was happy I was able to get this one from J&P. I'm 6'2 200lbs. Bought the large tall. Fit is perfect. Plenty of arm length for riding. Gold club pricing is a plus. Dixxon flannel’s are the best ever. happy that they did one for J P Cycle both have awesome products. Got this for my son. 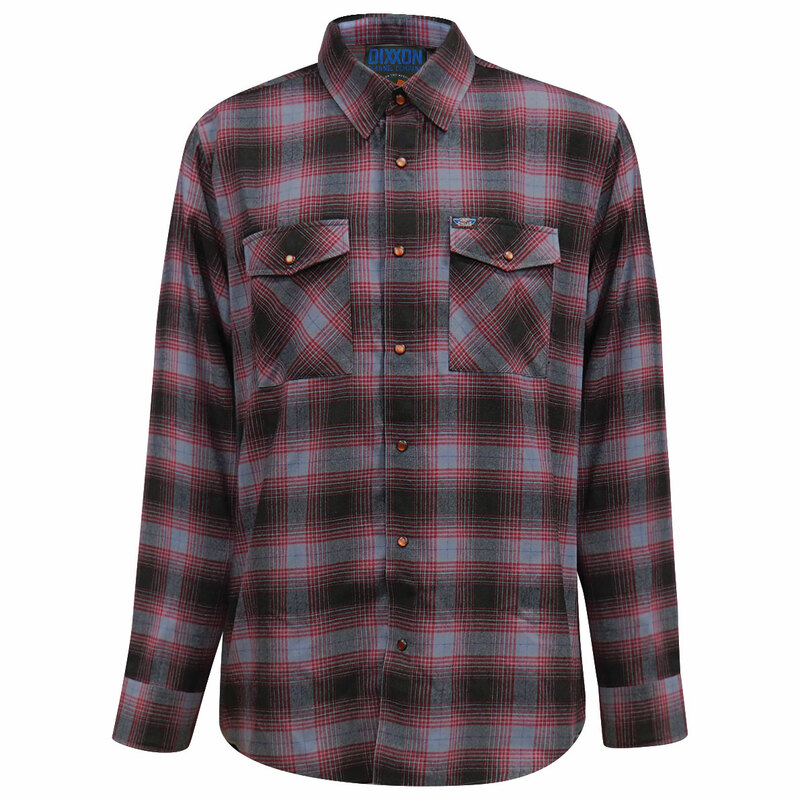 It’s a good looking yet rugged shirt. Dixxon is the best and the JP anniversary version is really a great shirt. Well worth the price tag.